Remove the ornaments as usual, then place the tree outdoors where you can see it from indoors. Either alone or with other greenery to create a vignette, your tree will become added winter interest to enjoy for months. My Christmas tree went out the back door and was greeted the next day by Old Man Winter’s snowfall — so beautiful. By March, trees will dry out and become brittle, making them easy to break apart by hand and place into a compost pile. 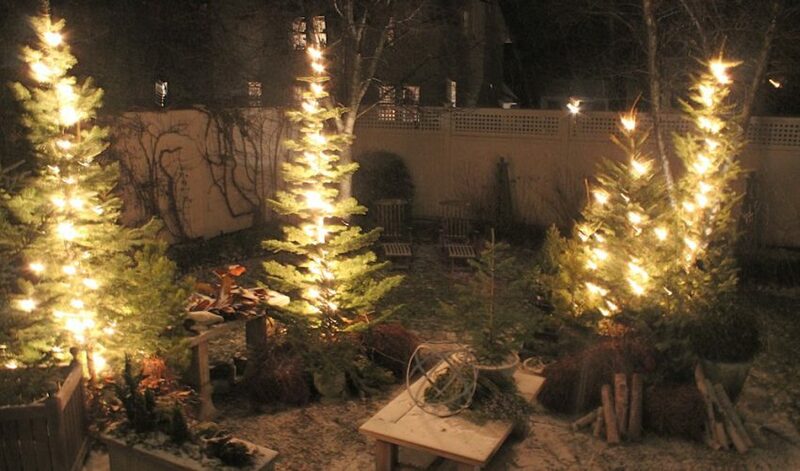 For an added plus, if the lights you’ve used are indoor-outdoor, leave them in place when you move your tree; illuminating it outside will add a magical dimension to your view. Additionally, putting your old tree outside until Spring allows it to “work” in the garden — by creating an environment in which wildlife can nest and seek protection. If you or your neighbor owns a wood chipper, your Christmas tree can be easily ground-up and used for mulch in the garden. The beautiful collection of evergreen clippings that one served on the fireplace mantel or around the door can now find a new use to help flesh out empty window boxes. Outdoor wreaths and garland can be placed in or on top of unused planters for much added textural interest. Evergreen clippings, wreaths and tree branches can be placed over garden perennials to protect from Winter winds. With a little ingenuity, almost everything Mother Nature provided for your Christmas dÌ©cor can serve double-dÌ©cor-duty — and pay Mother Nature back, too.